​Thèid Mòd Ionadail​ Inbhir Nis 2019 a chumail Dihaoine 21mh & Disathairne 22mh den t-Ògmhios. Gheibh sibh tuilleadh fiosrachadh, foirm iarrtais agus clàr a’ Mhòid bho làrach-lìn Mòd Ionadail Inbhir Nis. ​Bidh Meur Inbhir Nis den Chomunn Gàidhealach agus Comataidh Ionadail Mòd 2020 an làthair aig Fèill an t-Eilean Duibh, anns a’ Bhlàr Dubh air Diciadain an 2mh agus Diardaoin an 3mh den Lùnastal. Ma tha botail agaibh a bhiodh sibh airson a thoirt dhuinn airson an tombola againn, bhiodh sin math dha rìreabh. Cuiribh fios dhan chomataidh air an duilleag Facebook aca no cuiribh post-d gu rùnaire Mòd Ionadail Inbhir Nis. Dannsa Bhalentìneach an Loch Abar! Following another successful Mod held in Sgoil an Iochdair on the 29th and 30th of May with a turnout of well over 300 competitors, the Committee would like to thank all who took part, competitors, teachers and parents. A special thanks goes to those who helped with the organisation, home baking and smooth running of the Prizewinners’ concert. All adjudicators were delighted by the level of talent among competitors. A fantastic day where gaelic culture and heritage was very much alive . Also to all the adjudicators and chairpersons who took the time to make the event possible. A special thanks to all staff at Sgoil an Iochdair for their continued support. We would also like to thank all Councillors for their valued funding. We look forward to seeing you all on the 27th and 28th of May 2016. Just a quick reminder that entries for the Inverness Provincial Mòd close this Friday, 24 April 2015. All entry forms should be returned to Ross Brindle by this date, along with all translations, own choice music, art work and literature if applicable. the correct piece as printed in the An Comunn Prescribed booklets. An updated copy of the syllabus is included below. You will also find a multiple entry form which you may prefer to use for entering groups of children. ​Thèid Mòd Ionadail Dhùn Èideann a chumail air an 25mh Ceitean ann am Bunsgoil Taobh na Pàirce, Bonnington, Dùn Èideann. Gheibhear tuilleadh fiosrachadh mu dheidhinn Mòd na bliadhna seo air an làrach lìn aca no air an duilleag Facebook aca. Tha sinn an dòchas gun tèid gu math dhuibh uile! Bidh mòran agaibh air tòiseachadh le ullachaidhean airson Mòdan Ionadail 2014 mu thràth. Ma tha tachartasan, coinneamhan no càil sam bith eile gu bhith agaibh a dh’ aithghearr, cuiribh thugainn an fhiosrachadh agus cuiridh sinn suas e air an làrach-lìn seo, dhan chuairt-litir againn agus air duilleag Facebook. Cha bhi farpaisean abhaisteach aig Mòd Ionadail Rois an Iar Dheis am bliadhna. ‘S e farpaisean pìobaireachd a bhios ann a-mhàin. Visitors to the county will come from all over the North Highlands and beyond with competitions in a number of musical disciplines.The main competition venue for the “Mini-Mòd” will be the Assembly Rooms where the climax of the festival will be the Gala Concert and Ceilidh Dance in the evening hosted by MG Alba Marketing Manager, Murdo Morrison with guest artiste and National Mòd Medallist, Alasdair Whyte from the Isle of Mull. Visiting the county over the weekend will be one of Scotland’s top Gaelic culture bands, returning after their successful performance at the National Mòd Fringe in 2010 – The Iain Angus MacLeod Band. The programme detailing competitions will be available this week and will be in local shops and public buildings or by contacting one of the local An Comunn branch committee members. The festival will have instrumental, group, solo and choral competitions taking place, starting at 9am in the Assembly Rooms where the Mod office will be located. One of the highlights of the Provincial Mod will be the choral competitions with the county hosting a number of choirs for the day – these competitions will be held in the main hall at the Assembly Rooms starting at 1.30pm. Aberfeldy Mod, Scotland’s greatest regional Gaelic festival, is once again set to descend on the Highland Perthshire town on 8th and 9th June 2012. Organisers of this year’s Mod are now calling on individuals and groups wishing to enter into the wide variety competitions to do so by Monday 21st May. 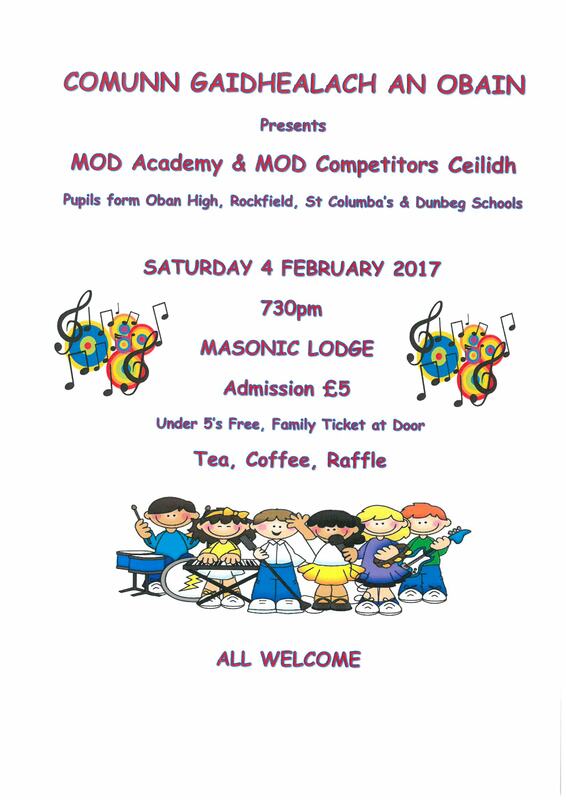 Now it its 89th year, the Aberfeldy Mod is a celebration in competitions of Gaelic culture and music. Participants range in age from 5 to 95 and come from all over Scotland and beyond to take part. This year, the committee have launch a new website, www.aberfeldymod.com, to help people find out about the event. Much work has gone on in local schools throughout the region to prepare participants for the events, with the children’s competitions being held on the Friday. As well as traditional competitions such as junior choirs, solo signing and storytelling there other events in areas such as poster design and best radio or video programme. Children can also enter instrumental competitions in piano and clàrsach amongst others, playing their own choice of melody of a Gaelic song. Saturday sees the adults join the competitions with many events throughout the day. Piping, fiddle, accordion and choir competitions are just some of the events taking place. Spectators are welcome to attend many of the events. 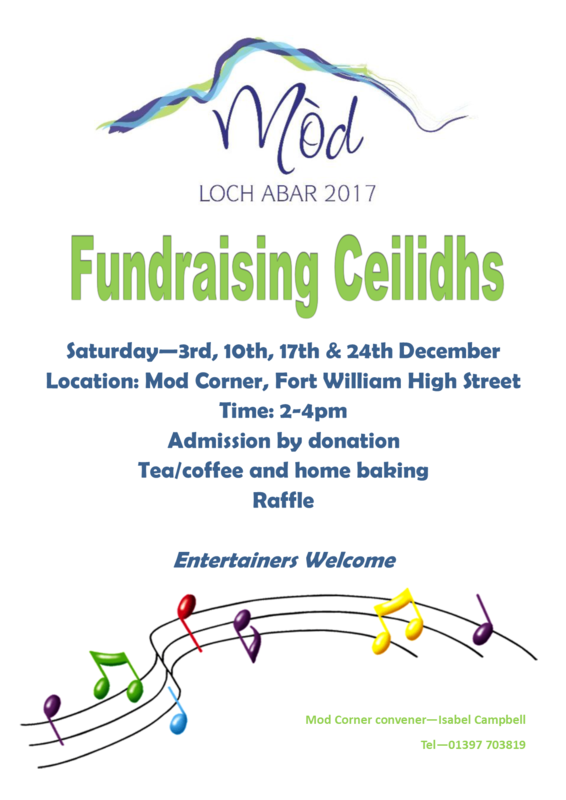 Information on venues can be found by visiting the Mod Office which is open in Aberfeldy Town Hall of Friday and Breadalbane Community Campus on Saturday. 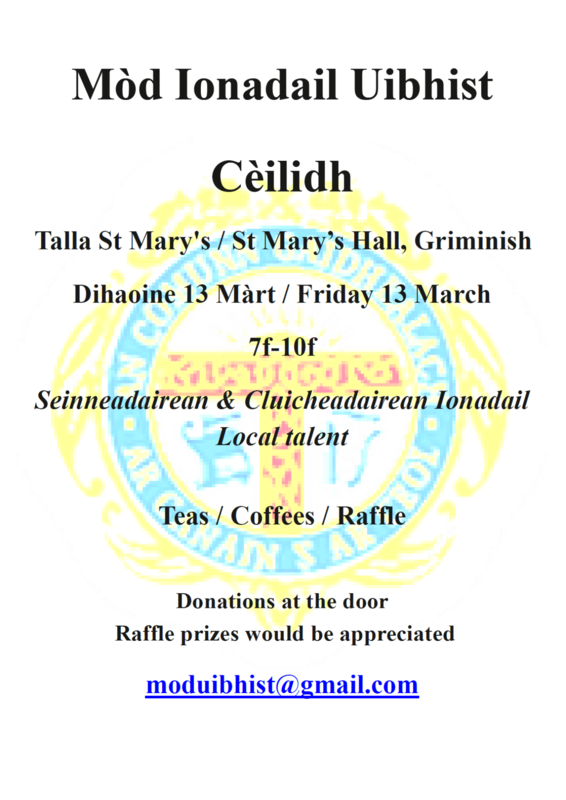 There will also be a cèilidh dinner held on Saturday evening to top the weekend off. The Mod committee are now calling on anyone with an interest in taking part to submit entry forms by Monday 21st May. Information on the Mod, competitions and how to get involved can be found at www.aberfeldymod.com. Tha Mod Ionadail na bliadhna seo air a chur dheth air sgàth’s gu bheil obair a’ dol air adhart aig Àrd Sgoil a’ Phluic. An Comunn Gàidhealach is delighted to announce that preparation is well underway for the staging of the first Barra & Vatersay Provincial Mòd since the 1930’s! The event will take place on September 30th and October 1st 2011. Instrumental competitions including fiddle, accordion, clarsach and instrumental groups will take place on the Friday evening with Piping, Oral, Vocal and Choral events on the Saturday. With the Royal National Mòd taking place in the Western Isles in October this year, it is very appropriate that the re-emergence of Mòd Iondail Bharraigh is Bhatasaigh will precede that. It is a perfect platform for those going forward to compete at the National Mòd. Provincial Mòd Liaison officer, Riona Whyte, has visited the island on several occasions and during her most recent visit called at local schools and held an after school workshop to encourage participation in the Mòd. 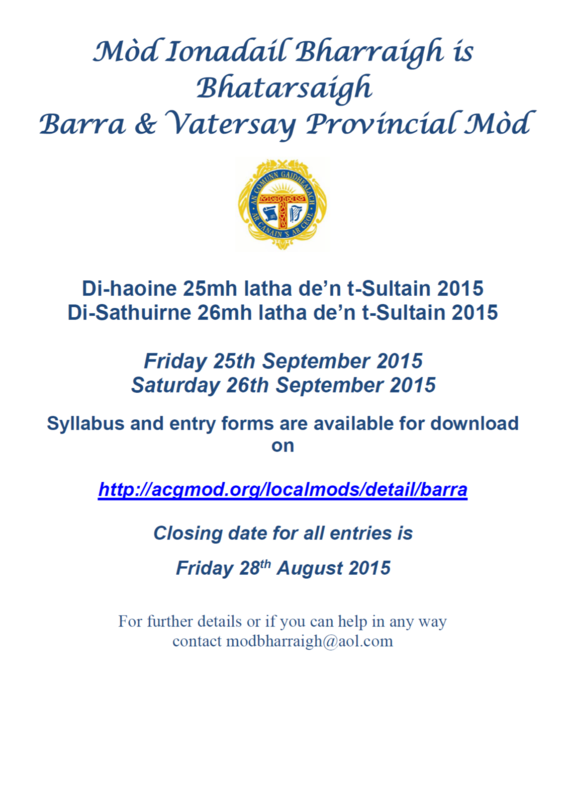 The syllabus and entry is now available on the An Comunn Gàidhealach website where there is a specific page for Mòd Ionadail Bharraigh is Bhatarsaigh http://www.acgmod.org/localmods/detail/barra.